Over the course of the last couple of years one of the most consistent stories throughout the sport of Boxing has been the rise and knockout streak of undefeated WBA/IBO Middleweight world champion Gennady Golovkin. 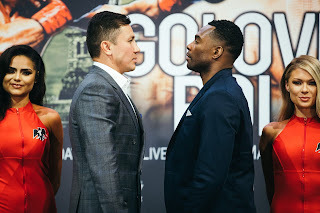 In his last fight, Golovkin successfully defended his title for the fourteenth time in May of this year scoring a sixth round stoppage of the very “Game” Willie Monroe Jr. The victory over Monroe also extended Golovkin’s knockout streak to twenty and was the champion’s thirtieth career knockout in thirty-three professional fights. It has become customary both before and after each Golovkin title defense for readers to hear this observer continue to ask the question of who can give the champion a significant test. Perhaps the question will finally be answered on Saturday night when Golovkin attempts to continue to unify the Middleweight division when he takes on recently crowned IBF world champion David Lemieux at Madison Square Garden in New York City, NY. When this fight was first announced in July there was an instant feeling of anticipation. Not only will Golovkin attempt to continue his march towards the all-time record for consecutive Middleweight world championship defenses of twenty set by Bernard Hopkins, but his fifteenth title defense will come against arguably the biggest threat to him in the division in terms of knockout power. In David Lemieux Golovkin will face a fighter who has won thirty-four of thirty-six professional fights and who has scored knockouts in thirty-one of those thirty-four career wins registering a career knockout percentage of 86%. In his last fight in June, Lemieux won the vacant IBF world championship with a dominant twelve round unanimous decision over former world champion Hassan N’Dam. Lemieux will enter into this fight having scored knockouts in three of his last four bouts. For three rounds Hagler and Hearns engaged in one of the most violent fights in Boxing history. Although a bloody Hagler would eventually emerge victorious scoring a knockout of Hearns, the battle elevated both fighters to legendary status and both are rightfully regarded today as all-time greats of the sport. Even though it is hard to envision two fighters equaling the intensity and violence of Hagler-Hearns, when you put two aggressive fighters against each other one with a career knockout percentage of 91% in Golovkin and the other with a career knockout percentage of 86% in Lemieux, it is hard not to get excited. The anticipation of this fight as well as Golovkin’s status in the sport can be demonstrated by the fact that for the first time since becoming a breakout star in the sport, a Gennady Golovkin fight will headline a pay-per-view broadcast done by HBO Pay-Per-View. Although there have been several times over the years where a Cable/Satellite pay-per-view Boxing card has in one way or another failed to live up to the anticipation that preceded it and have left a bad taste in the mouths of consumers who are more often than not asked to pay an expensive fee to see the card, this is one instance where consumers are likely to be satisfied no matter what happens in this fight. In terms of how each fighter might approach this fight, it would not surprise me to see a somewhat tactical battle initially. After all, both fighters are well aware of what the other can do and are aware that they both can end a fight with one punch. The key to this fight in my eyes may simply come down to who is able to land the first significant punch. Although as this observer has often said over the years “Anything can happen at any given time in the sport of Boxing and that is what makes the sport great”, It is hard not to expect a battle to break out at some point in this fight regardless of how respectful the fighters might be of each other’s power. Even though this observer is not one who likes to give solid predictions, it is hard not to expect an exciting battle for however long this fight lasts. Whether or not this fight will eventually be part of the discussion along with Hagler-Hearns and other great battles that are considered classics remains to be seen. In this observer’s eyes however, the ingredients are there. Two knockout artists being pitted against each other in one of Boxing’s most historic venues with the unified World Middleweight championship at stake. The Boxing world now turns it’s attention to Madison Square Garden to see what could be a historic battle that may ultimately benefit both fighters regardless of the outcome. We will see who emerges victorious Saturday night. Golovkin vs. Lemieux takes place, Saturday, October 17th at Madison Square Garden in New York City, NY. The card will be televised on a pay-per-view basis in the United States and Canada by HBO Pay-Per-View for $59.95 HD/$49.95 SD. Contact your local cable/satellite provider for ordering information. In the UK and Ireland the card will be televised by BoxNation. Check local listings.